During the winter here in Columbus, you probably use your heating system every day. The heating system in your home is critical to your comfort in your home. With so much use and with such an important job, it’s critical that you take care of your heating and air conditioning system. We all recognize the importance of regular oil changes for our cars, but few people realize the same principle applies to our HVAC systems as well. At Quality Air Heating and Air Conditioning, we offer a comprehensive heating and air conditioning maintenance plan in Columbus for systems of all types and brands. Here are some of the benefits of getting your heating and air conditioning systems regularly maintained. Reduced repairs – With regular heating and air conditioning maintenance in Columbus, you have the potential to reduce the chances that you need costly repairs. During regular inspections, the technician from Quality Air Heating and Air Conditioning will be able to spot small problems and repair them before they turn into larger, more expensive repairs. Increased efficiency – With time and use your heating and air conditioning system will start to develop inconsistencies and wear down. With regular cleaning, lubrication and replacement, your heating and air conditioning system may be able to regain some of that efficiency. Increased lifespan – Many of the heating and air conditioning replacements we do in Columbus were caused by a tiny issue that was allowed to develop into a catastrophic failure. Getting your heating and air conditioning system regularly inspected and repaired may allow you to extend the life of your equipment. 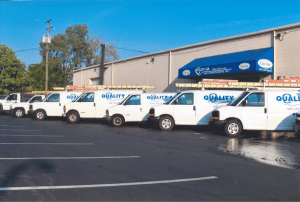 If you’re interested in setting up regular heating and air conditioning maintenance for your home in Columbus, call Quality Air Heating and Air Conditioning today!